WIXY had three reunions in the 1980s and one in the 1990s, sponsored by WMJI-Majic 105.7, Cleveland's Oldies Station - who, at that time, was using the old WIXY studios at 3940 Euclid Avenue in Cleveland. Many former WIXY DJ's flew in from all over to attend these events, which were documented on audio (1987 and 1997) and video (1988 and 1997). 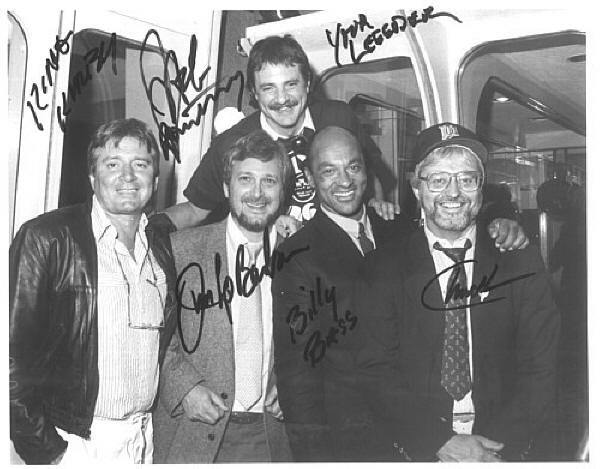 Here is an autographed picture of 5 of the DJs who returned to Cleveland for this historic reunion! Many aircheck collectors have audio from this weekend in their collections. Here are some screenshots of some "moments" from the raw-footage video (shot by your Webmaster!) from this great reunion! See the top of this page for videos from this Reunion, now available for viewing on YouTube.com! For information about the completed video for the 1988 reunion, please contact the Webmaster. To date, this was the last WIXY reunion in Cleveland, and it was held in conjunction with the Ghoulardifest, which was held during the same weekend. The Most Happening Station in Town! keep scrolling down for more!